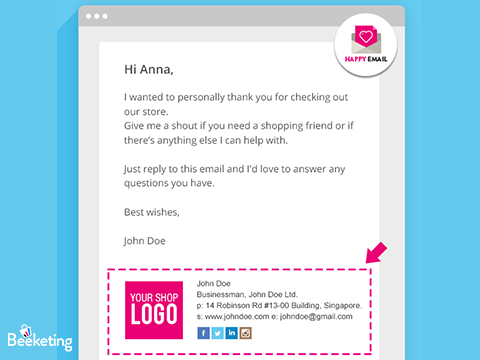 Automatically send a thank-you email from your store to new customers after 30 minutes. Connect with your customers and build trust through your brand. No need to worry what to write to your customers. We’ll do it all for you. 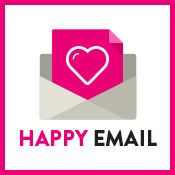 Why should I use Happy Email? Make a great first impression with your customers. It's so natural that it feels like you personally write the emails yourself. Build trust and encourage future purchases. Increase the chance to turn them into loyal customers. Emails will be carefully written based on your information and customer behavior. After one-click install, you won’t need to worry about anything else, we’ll take care of the rest. 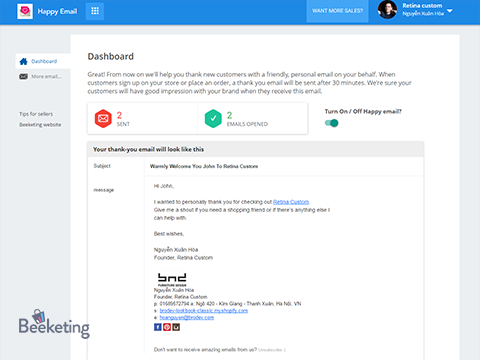 Happy Email sends a thank-you email from YOU to your customers automatically, 30 minutes after they make the first order, or signup for an account on your site. It helps to create a personal touch and gain trust from your customers. Easy to install (<2 minutes). Everything is automated, no coding required. Customers recevie a unique personal touch, increasing the chance they'll makie future orders with you. This app only supports sending emails in one language. Check out our other app: Quick Facebook Chat. Contact [email protected] for support within 24 hours. Support is in English.